I hope you are all doing marvellously? If you've been following us on Facebook and Instagram, you'll know that I recently ordered a book online. A book that I was so insanely excited about, that I was literally counting down the days until it was delivered! 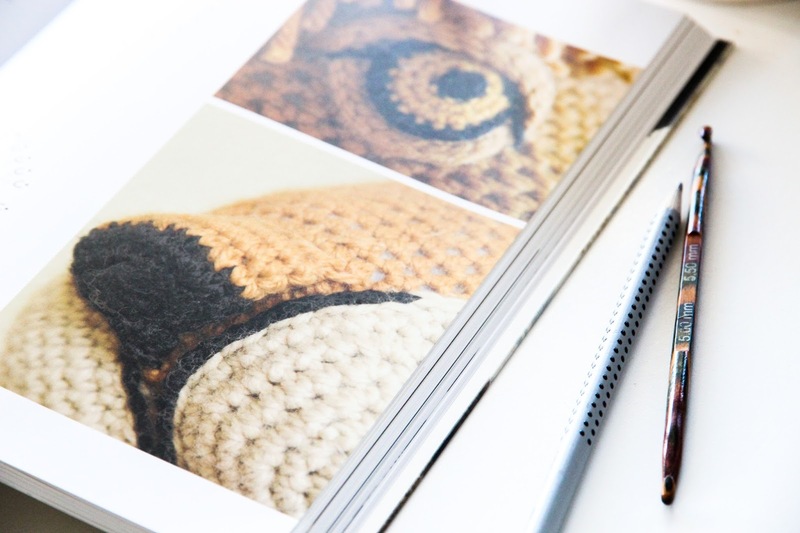 I stumbled upon the book whilst browsing over some of the amazing crochet talents that we follow on Instagram. 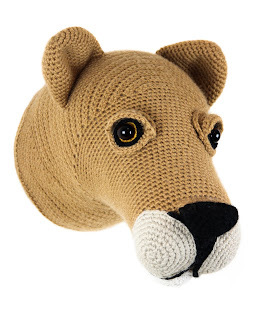 Amongst the feed of pictures, I came across an image of the most beautiful and intricate crocheted zebra head. It was perfect in every sense! Being hugely inspired by this amazing creation, I got to work trying to track down the pattern. 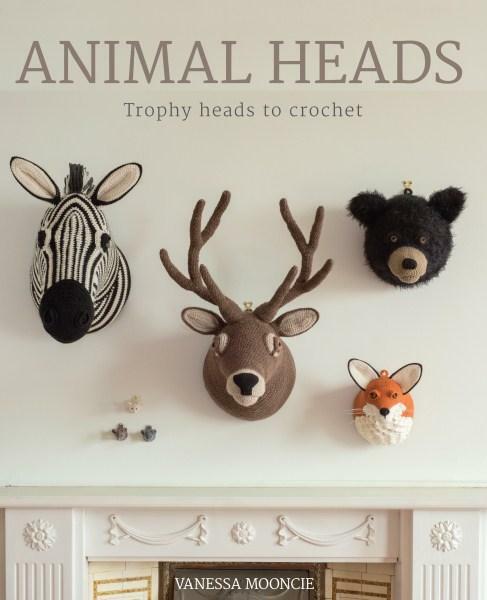 After a little bit of research, some prodding, probing and question asking, I discovered that the zebra head was from the book Animal Heads, trophy heads to crochet, by Vanessa Mooncie. I ordered the book from Amazon right away! Now I understand that if you think about the reason for a trophy head and the history surrounding trophy heads, the idea is somewhat gory. These trophy heads are not that though. 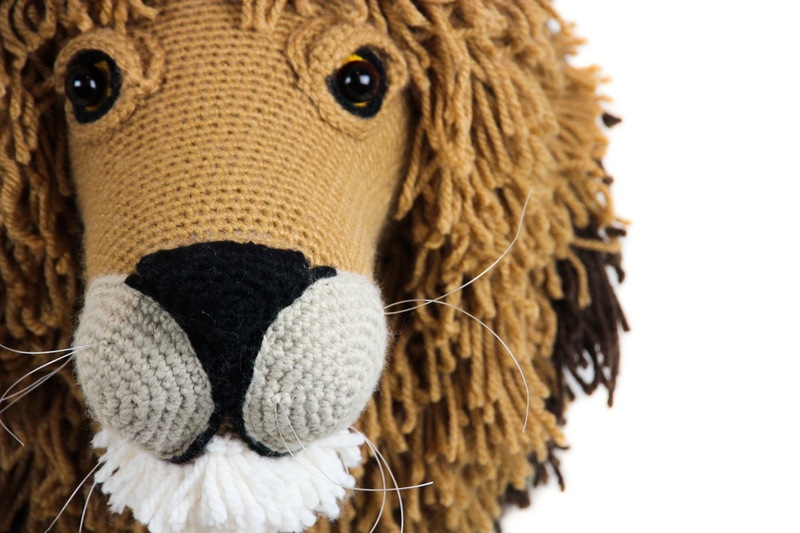 They are handmade works of art, a fun idea and in no way inhumane towards the precious animals that they represent. 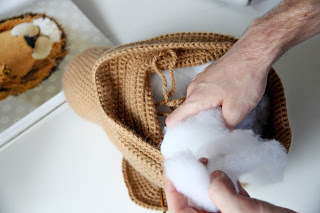 It's just crafty fun and it makes a change to crochet something different. After what seemed like an eternity (but was actually just two weeks), the book arrived! 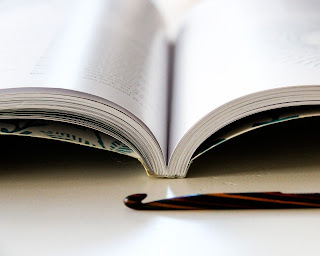 What a lovely book it is! It's gorgeous in design, styled beautifully and contains stunning photographs of all the projects. As you can tell....I'm a big fan. After spending an evening browsing the pages and admiring all of Vanessa's fabulous patterns and projects, I knew which project was to be my first.... The king of the jungle....The Mighty Lion!! I followed the recommendations in the book and ordered the exact yarn that Vanessa had used for her lion. 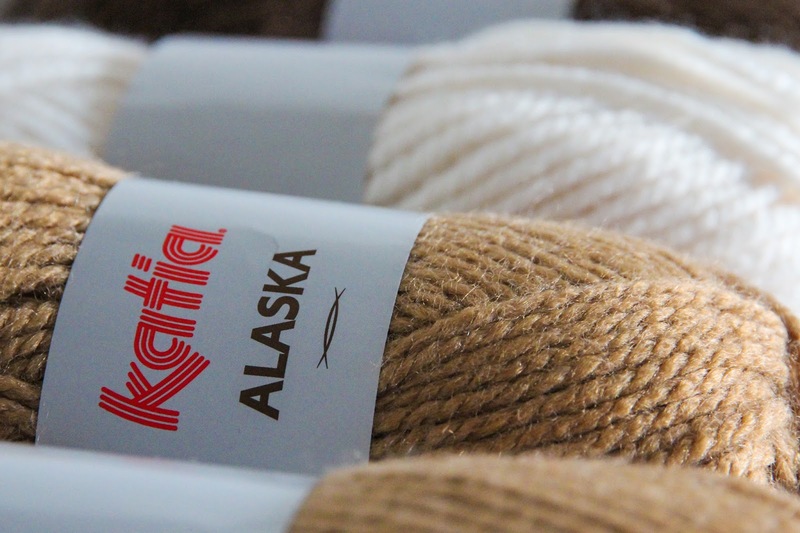 In this case it was Alaska, a chunky acrylic yarn, from the brand Katia. Of course as soon as the yarn arrived I got to work, hooking up a storm! I followed the pattern carefully, as it always takes me a little second to get into the style of how new patterns are written. I made sure to double check my rows with the instructions, checking for any slip ups I may have made. Of course there were times when I wasn't totally sure what I was doing (as with most patterns), but the great thing about this book is that the written instructions are accompanied by hand drawn diagrams. If at any point the written instructions were not clear enough for me to understand, a quick reference to the diagram would soon sort out any confusion that I had. 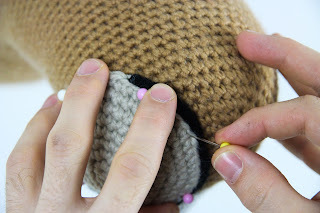 The pattern started by crocheting the main body of the head. 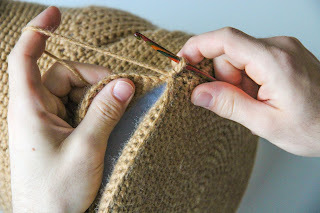 It incorporated crocheting a cardboard base into the head, which would later act as the "mounting board" and enable the head to hang flat against a wall. The body of the head worked up nice and fast, mainly due to the nice chunky yarn that I was using. I loved watching this creation grow! 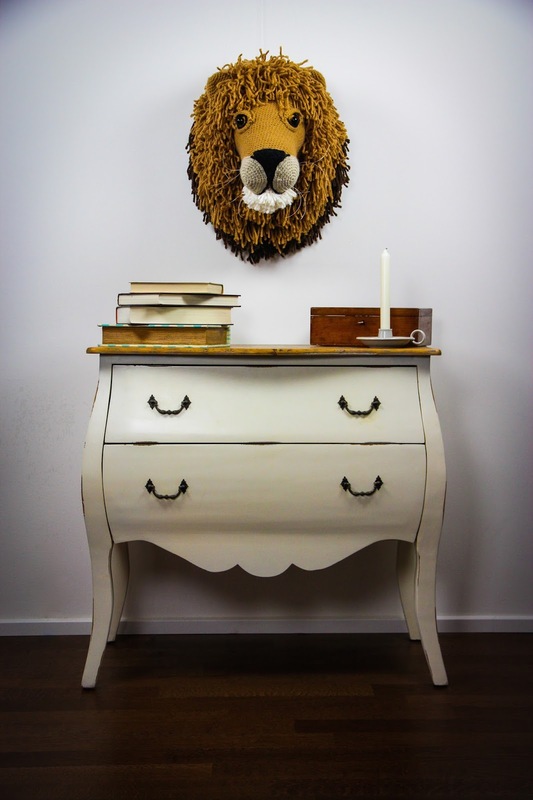 It was so exciting for me to see that it was already slowly becoming a lion. 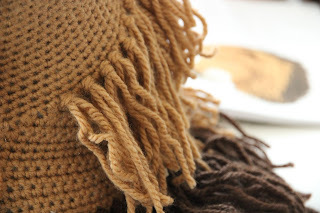 I liked that I could already tell that the head was going to be fairly large, it was going to be big and bold, a mighty crochet statement! Vanessa Mooncie has been really clever with the designing and shaping of the head and has used methods of creating flawless shapes in ways that I have never considered before. It was a definite eye opener for me in terms of our future Boys & Bunting pattern designing. 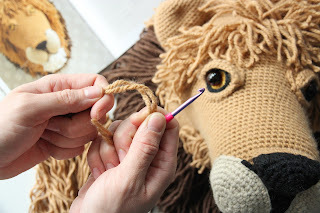 Once the basic head shape was finished, I continued with the instructions and constructed the facial features of the lion. A chin, some cheeks, ears, eyes and a nose completed the set of facial features. Once all of the features had been made I got started pinning the them in place. 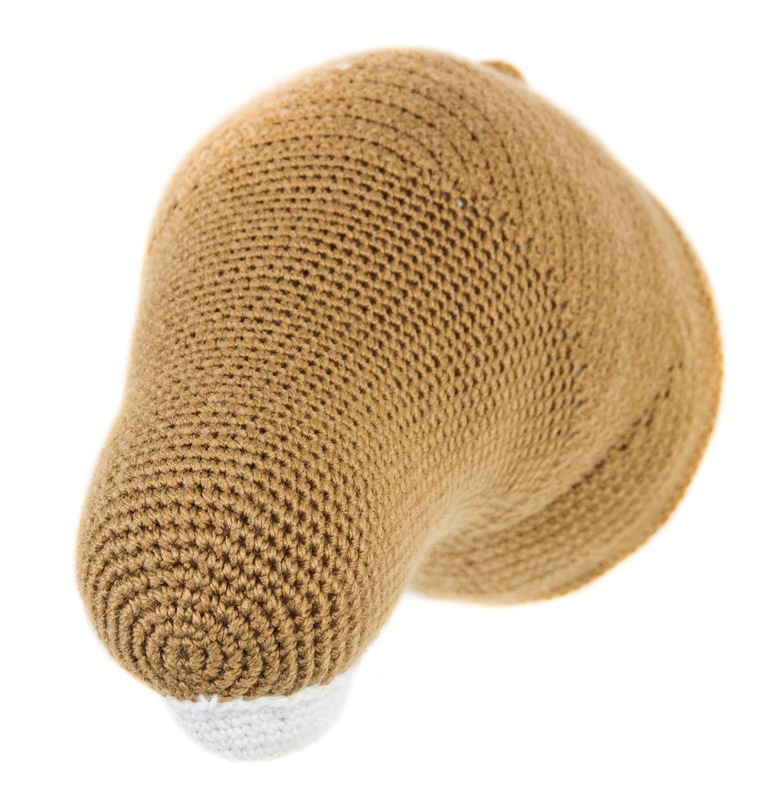 I checked that each of the facial components was placed correctly before securely sewing them in place. I followed the pattern for each of the facial features exactly as written in the book. The only alteration I made was with the eyes. 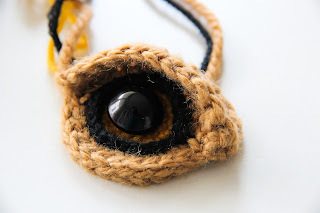 For the eyes I worked them up according to the written pattern and then added some 15mm glass eyes on top of the crocheted pupil. I loved the effect of the glass eyes, they really gave the lion character. Once all of the facial features were in place, it was time to turn this lioness into a lion. He needed a mane!!! 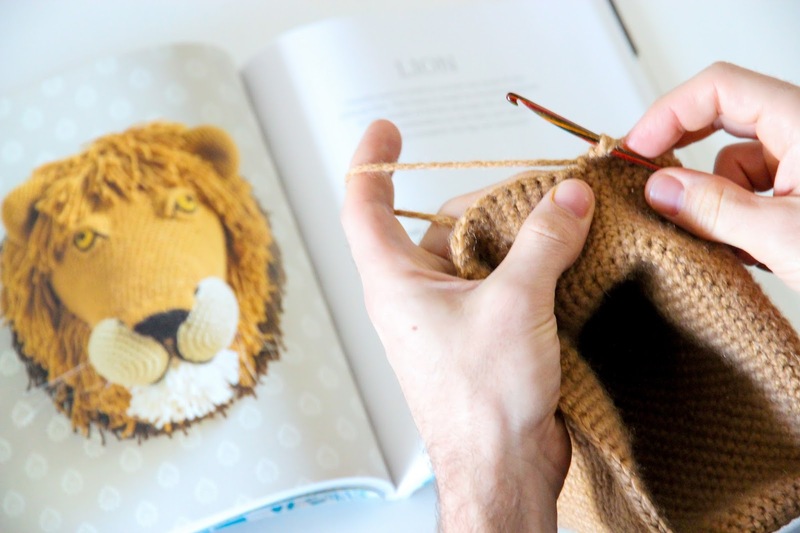 The instructions of the book clearly indicated how to add the mane and how long each length of yarn should be. Attaching the mane was simple enough, but was the most time consuming aspect of the whole project. 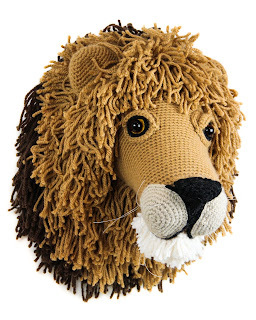 The time it took to add the mane was well worth it though, as it transformed the lion! Finally some fishing line whiskers were added and this ferocious feline was ready to ROAR!!!! I am so insanely happy with how he turned out!!! 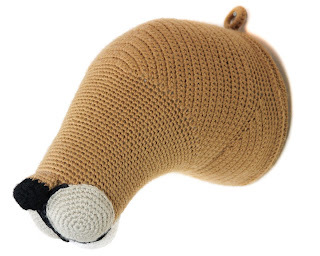 He is a perfect crocheted piece of art and a great decoration to our home. I'm not totally sure where we are going to put him yet? We are still having a play around with some options. He definitely has to go up on one of the walls though! I just wish we had a craft room, he'd be perfect there! This was such a fun make and the book certainly lived up to all of the excitement and expectations that I had. 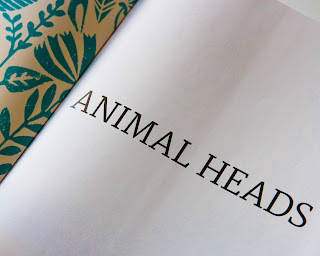 I can't wait to get started on my next crocheted animal head. I wonder which one I'll make!? What a funny project! 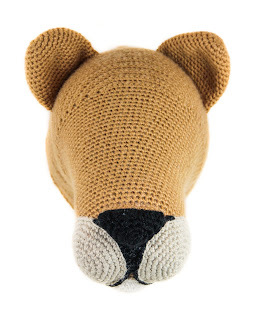 I love the construction of the head. I can sort of see the rows of the top of the head connecting to the lower part - very interesting. You guys never disappoint. Absolutely stunning. I love the progress photos too! Wow! I love how you show the steps, too! I saw this book weeks ago and concluded it was way too challenging for me. But thanks to your lovely photos and descriptions, it feels totally possible now. Thank you so much for the inspiration! Hi, I have this book but am currently stumped on interpreting one bit of terminology! He looks so nice! 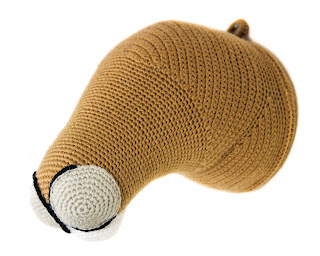 I am crocheting the bull but I do not understand the beginning of the base... Maybe another day will make it clear. Great job you did! Where did you find the glass eyes? 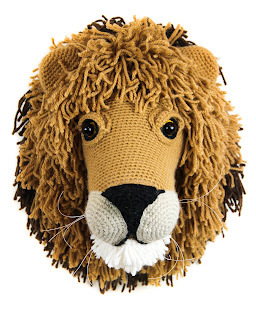 I would love to be able to make the lion head.. it would be the perfect lion bank for my lions club..